The most famous of all the many Russian Dolls produced over the last 100 years must be the Semyenov style from the Nizhny Novgorod Region of Russia, about 500 Kms from Moscow. In the 19th Century the factory produced various wooden items such as spoons and bread boards and it was not until about 1930 that they began to produce nesting dolls. At this time they also produced wooden toys and a range of birch bark items, products which continued to be made to the end of the 20th Century. This most simple of dolls usually painted with a yellow head scarf and red dress with a rose design on the front. The Semyenov factory existed well before the revolution mainly producing wooden items of tableware. In about 1932 it was set to produce a wide range of toys and other products including Russian Dolls and was a significant employer in that town until recently. It has now been taken over completely by its near neighbour the "Hochlamaskaya Rospis". Although the has slowly developed over the years it is fundamentally the same as it was in the early days. The factory was privileged in that it was these dolls that were exported throughout the world under the communist regime. In the 1960's two 72 piece dolls were manufactured as promotional items. 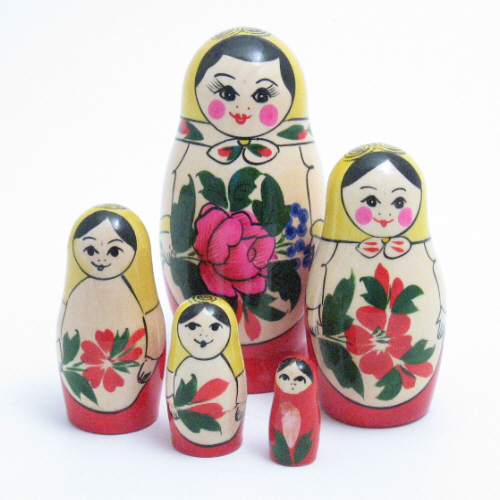 Although the standard colours of Semyenov dolls are yellow top/red skirt it is not unusual to find these colours reversed. Indeed it is possible to find green, purple and even black dolls, although these colours are usually restricted to the outer piece.Of particular interest to collectors now are dolls which not only have their original orange made in the USSR labels but also retain their original cardboard boxes. Our collection contains a 16 piece doll in an original box. Since perestroika the factory has put a number of automatic machines into place making it the only automated production facility in Russia for Russian dolls. The workforce has suffered with an estimated reduction from 3000 in 1990 to around 500 now although this figure includes all workers not just those engaged in the production of dolls. In addition to the standard dolls there are a large number of other styles from Semyenov including animals, viking figures, Santa Claus and different maiden designs, all worth looking for but becoming increasingly rare. This factory now operates on a very commercial basis and it is possible to order dolls in large quantities for delivery anywhere in the world. Sadly they remain out of touch with the value of their product and are very inflexible in pricing. Also they are unable to control the numerous copies of their work produced by individuals. At this time it is difficult to see how the factory can keep producingwithout some regard to the final sales price of thesse items. First a word of explanation. The ancient town of Sergiev Posad with its St Sergius Trinity Monastery (founded in1340) is the centre of the Russian Orthodox Church. After the revolution the name of the town was changed to Zagorsk and only in 1992 was the original name re-instated. The result of this name change is that the Matrioshka made here are usually known as Zagorsk style dolls.The town of Sergiev Posad is a short journey from Abramsova and by the time Maliutin and Zviozdochkin were making their doll there Sergiev Posad was well established as a toy making centre. The huge market place in front of the monastery has been a trading place for centuries.Initially dolls were produced for fun and in the first years of this century a caricature of Ukranian leaders or Hetmen was produced. The forunner of the Gorby doll. Dolls were also made depicting characters from Russian folk lore as well as from books. A popular story was the tale of the farmer and the giant turnip. 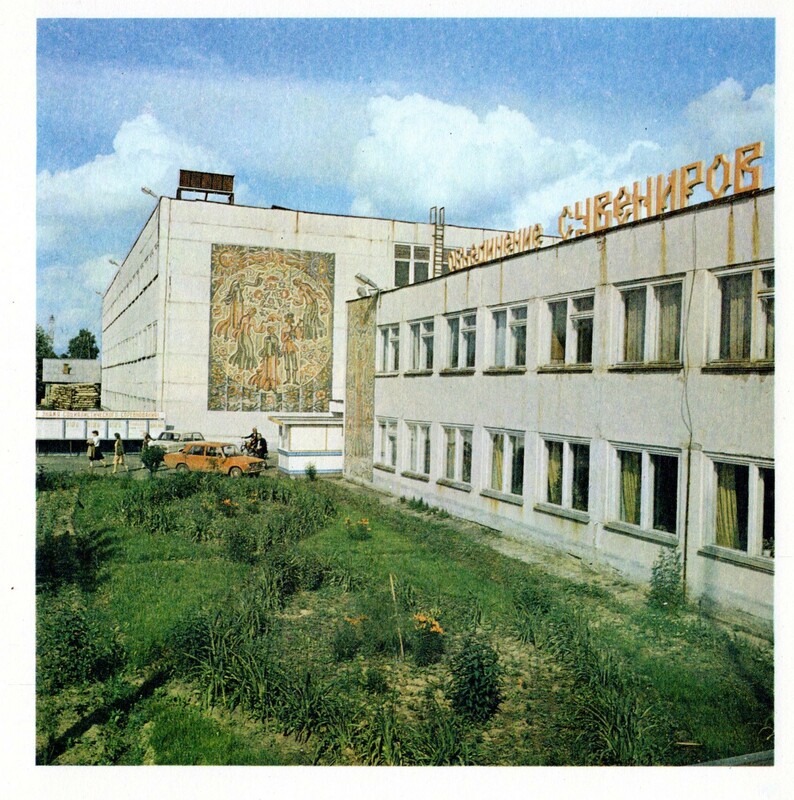 Eventually the factory began to make one specialised design which we now recognise as the typical Zagorsk style. The communist period greatly reduced the free expression of the pre-Revolutionary artists. The standard doll produced here was special in that the colour of each doll in a set is different. They are very simple as can be seen from the picture above and can still be found in some shops. They were not exported in the same quantities as the Semyenov style of doll. The photograph shows the factory in full production in the mid seventies. After the changes brought about by the collapse of the communist system the factory quickly ran into trouble. By 1994 the satellite factories had closed and by 1997 the main factory outside the gates of the monastery was also effectively closed for the production of matrioshka. It has become less lucrative for artists to work on their own than immediately after the end of the Communist period although many still supply the tourist trade in Moscow which is only a short journey away by train. Probably over half of all dolls sold today are made in this area and have Sergiev Posad written underneath them. Polkov Maidan is a collection of small workshops in one large village all producing in a similar style. Much of what is produced here is sold on the internal Russian market place as unpainted items or zagotovki as the Russians say. It is theoretically possible to order any shape or size of blank from this area. Like Semyenov there is a long history of production of wooden goods from this area and it is a natural extension to produce nesting dollls. In the beginning the dolls were produced with a mixture of Poker work and paint although the use of pokerwork soon ceased. The designs of the dolls are little changed in sixty years. The main feature is the dog-rose created using bright analine dies. Only strong colours are used and to some the finished product is just too bright, almost garish, with strong reds, blues, yellows and mauves. Decoration is always larger than life The tradition of wood-turning is strong and boys as young as ten can turn a reasonable doll. Painting is almost exclusively done by women and girls who often work outside in the Summer as in the picture. In addition to Matrioshka the village of Polkhov Maidan is known for wooden samovars, spoons, piggy banks and other small wooden items. Probably the least known of the major factories in Russia is that at Nolinsk in the region of Kirov (Vratsky). This centre of production has existed for some time and its main design is very similar to that from Semyenov - the major difference is that the Kirov dolls have a poppy on the front, the Semyenov has a rose. Another important feature of many of the Kirov Matrioshka was that they had a straw inlay design. At one time this was actually cut into the wood but now the straw is only stuck onto the surface. These are still available but are becoming less common. The picture was taken from the best Communist period book we know which was produced for the Olympic Games in 1980. In recent times the Kirov factory has begun to produce a selection of different designs and shapes such as the Snow White illustrated here The factory continues to pack the dolls in plastic bags with the traditional simple Russian label. ©2018 - Russiandolls.co.uk -- 49 St Mary Street Cardigan, SA43 1HA.01239 623790..